Hexagonal tiles, also known as hex tiles look so immaculate and complex when put together. Just like sort of diamonds put together or a friendlier version of a honeycomb stitched together on floor or wall. Hexagonal tiles when mainstream across America during the early 20th century and have been in vogue since. And why not? For all their mind-boggling patterns, they ensure a highly chic home décor design. And if you͛re looking to bring these beautifully sophisticated and inherently detailed accents in your home or commercial space, then have a peek at our selection of hexagonal bathroom tiles. Some of the most versatile and interesting tiles you͛ll ever come across, we have hexagonal bathroom tiles which will give you an intrinsic, seamless look. 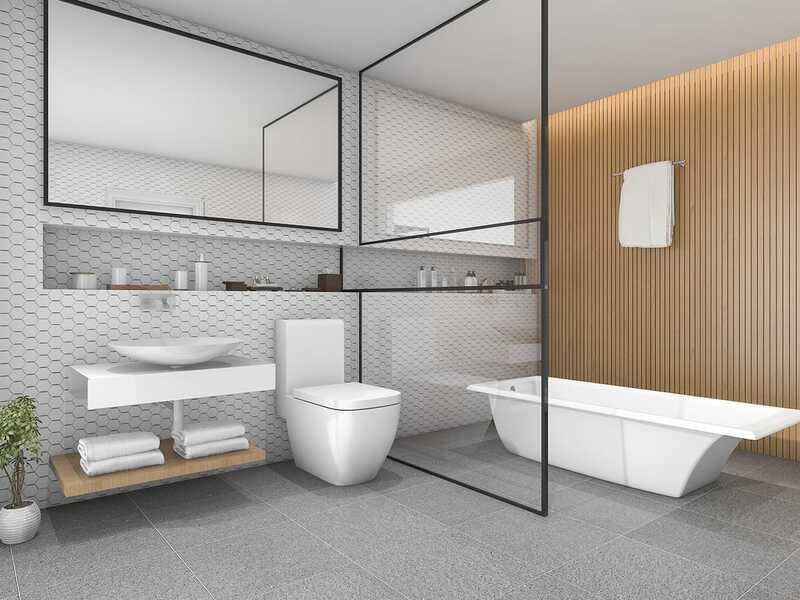 Whether you͛re looking to create a quiet, calm retreat or a cluttered, vibrant one, we have hexagonal bathroom tiles which will help you create the perfect look. A great way to create intrigue and add fun to a boring bathroom space, these hexagonal tiles will be a curios presence in the setting till times to come. Available in multiple styles, shapes, colors, textures and sizes, we have bathroom tiles which will fit in beautifully no matter what interior style you have. With a touch of high style and charming looks, our range of hexagonal bathroom tiles will be a timeless, trendy addition. And if you have any creative ideas about patterns or colors, then let us know. We͛ll create custom hexagonal bathroom tiles exclusively for your space. Highly flexible, durable and chemical resistant, our hexagonal wet room tiles will help you craft complex shapes and styles in your space without any hassles. These bathroom tiles are easy to clean and maintain and will style up the setting on a budget. Our decorative bathroom tiles have graced residential spaces as well as commercial projects including retail spaces, bars, restaurants, hotels and offices and have successfully created desired aesthetics. Some of the most dramatic and whimsical tiles around, our hexagonal bathroom tiles will be a cool, bold feature in the setting till times to come. Just install them in your bathroom or wet rooms and watch them play an important role in the design and atmosphere of the space. They will be like ͚jewelry͛ for your setting. A six-sided style and adornment!